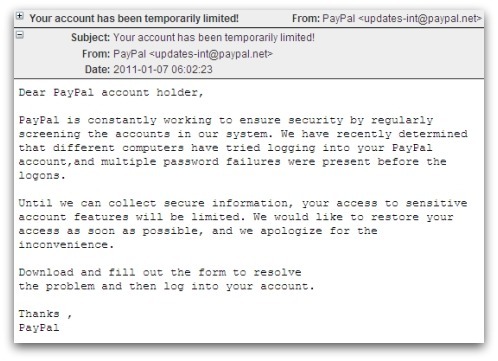 Have you received an email, seemingly from PayPal, declaring that your account has been temporarily limited? Plenty of people have been targeted by an attack which uses the subject line "Your account has been temporarily limited!" and claims to come from what appears to be an offiicial PayPal address. Well, beware opening the attached reactivation form too quickly because you could be passing your personal information to cybercriminals. Because the emails are bogus, and the headers are forged - all with the intention of stealing information from you. Sounds scary, eh? People on different computers have been trying to log into your PayPal account, and have been guessing at the passwords? Nasty! Those nice folks at PayPal are looking out for you! They've locked down the account because of all the attempted intrusions. Thank goodness! But these emails and the form don't really come from PayPal, and entering your confidential information into the form is only going to pass your private data to the cybercriminals behind this spam campaign who will use it to phish your account for money and perhaps steal your identity. Sophos customers are proactively protected against this attack. You may not have fallen for it (the lack of graphics in the email body make it look less convincing than some of the PayPal phishing scams we often see) but you may have other loved ones and acquaintances who would be vulnerable to an attack like this.